Professional Bookkeepers taking care of your day to day Business Accounts Processing, Payroll and month to month Inland Revenue Compliance. 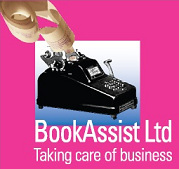 Suitable for businesses who need a Bookkeeper, but don't have enough work for a full time role. Certified Member of the Institute of Certified New Zealand Bookkeepers (ICNZB). Accounting and Payroll records are processed using Best Bookkeeper Practices and will be up to date and ready for the Accountant when they need them for Management Reporting and End of Year Tax filing.